With our size and the diversity of our services, we offer the ability to be a one-stop shop for your office needs. Dream big, and we’ll work to give you the desired image for your workplace while utilizing materials that offer the pricing and durability you would expect. Johnsonville is the largest sausage producer in the United States by revenue. Founded in 1945, today the company employs more than 1,200 people at its headquarters in Sheboygan Falls, Wis. With explosive growth over the prior decade, Johnsonville was in need of the capacity to support its planned future investments in engineering, research and development, and marketing. One Menasha Center is an eight-story office building located in the Northeast Wisconsin city of Menasha. The $12.6-million project was designed to anchor a revitalized downtown, bringing 300 jobs to the city center, as it replaced a decaying hotel which was torn down. BOE Group is a conglomerate of companies serving the transportation, technology, construction and renewable energy industries. It planned to move its offices to a relatively new, two-story building, which previously had served as the home of a for-profit college, on the outskirts of Green Bay, Wis.
Navitus Health Solutions is a full-service pharmacy benefits company headquartered in Madison, Wis. It provides services to government entities, self-funded employers, coalitions, labor organizations, third-party administrators and health plans. Belmark is a state-of-the-art manufacturer of pressure-sensitive labels, printed flexible packaging and folding cartons, established in 1977. The company, which has four facilities on its campus in De Pere, Wis., planned a 41,000-square-foot expansion to its Plant 3, along with extensive renovations to Plant 1.s. 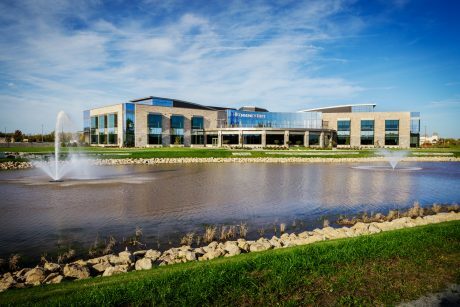 The third-largest credit union in Wisconsin, Community First Credit Union, constructed a new, $25-million corporate home office, paired with a full-service branch, to replace a 22-year old facility. More than doubling its prior space, at 130,000 square feet the mixed-use building features three wings, 39 meeting rooms and offices, a central rotunda to welcome guests, and extensive use of glass walls to provide an open feel and allow light in. Based in East Lansing, Mich., GreenStone Farm Credit Services is the largest agricultural lender in both Northeast Wisconsin and the state of Michigan. It has more than $8 billion in owned and managed assets, and serves 24,000 members with 36 branch locations. H.J. Martin and Son had the opportunity to have multiple divisions work on a complete remodel of the existing Perfroma Inc.’s office space in both 2014 and again for a smaller flooring project in 2018. Commercial divisions on the project included Walls & Ceilings, Commercial Flooring, Doors & Hardware and Glass & Glazing. Together Performa, as the architect, and H.J. Martin and Son developed a modern feel to the space without taking away the vintage feel of the historic De Pere, WI Lee Building the business lives in. Foth is a national engineering and consulting firm founded in 1938. With continued growth, the company decided to replace its long-time headquarters in Green Bay, Wis., with a new, $21 million building in nearby De Pere, Wis., situated prominently along Interstate Highway 41. As part of the relocation, Foth hoped to place roughly half of its 600 employees in one location, enhancing collaboration and efficiency. The purpose-built building also was designed to support the company’s expanding operational requirements. The flooring installation team of H.J. Martin and Son successfully navigates obstacles on many of its projects. A unique challenge was met late in 2016 during the remodel of the Camera Corner Connecting Point facility in downtown Green Bay, Wis.
Festival Foods is an experiential grocer with 25 locations throughout Wisconsin. With explosive growth over the past decade, the company had nearly doubled its corporate office staff since opening its original headquarters in De Pere, Wis. The five-story, $85-million corporate headquarters building and global technology center of an international dairy company was a cornerstone of efforts to revitalize the downtown of Green Bay, Wis. The 260,000-square-foot facility was designed to serve nearly 600 on-site employees, with expansion capability to 900 staff members. The Wisconsin-based cheese manufacturer and supplier constructed a new 87,000 square-foot corporate headquarters on a 42-acre site. H.J. Martin and Son's Glass & Glazing division installed a Kawneer storefront, windows, entrances and curtainwall. Specialty glass on the interior. H.J. Martin and Son's installation work on the Knight Development Building in De Pere won the company a 2012 Build Wisconsin Specialty Contractor Award. H.J. Martin and Son's 17,000 square feet of glass installation was acknowledged for enhancing the building's curb appeal and our installers were recognized for environmentally friendly work on the project, with 92 percent of the utilized aluminum comprised from recycled materials. HJ Martin flooring crews installed ceramic tile, resilient flooring and carpet tile throughout Plexus Corporation. Unique elements of the build included tile work around the bench and planter areas and carpet inset into ceramic tile in the reception area. As a new construction project, working site cleanup and maintaining a tight schedule were crucial to meet building opening dates. HJ Martin successfully built and glazed more than 38,000 square feet of curtain wall, including aluminum columns, glazed-in aluminum panels and storefront windows. It took approximately 1,210 insulated glass units and approximately 345 glazed-in aluminum panels to accomplish the complete curtain wall system. Every one of the 1,560+ units and panels was set from a boom lift on the outside of the building.